Bloom, beam blank and billet casters continuously cast molten steel into semi-products (bloom, beam blank, billet) of various sizes and shapes from various kinds of steel grades with cross-section smaller than slab semi-products. In order to meet customers’ needs, Steel Plantech’s casters highly excel in production efficiency and energy saving and realize various kinds and small quantity production of high quality casting semi-products. 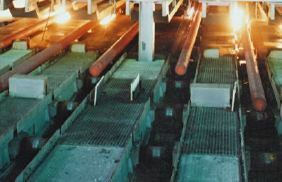 Adoption of Steel Plantech’s continuous casting facilities makes it possible to reduce production costs. 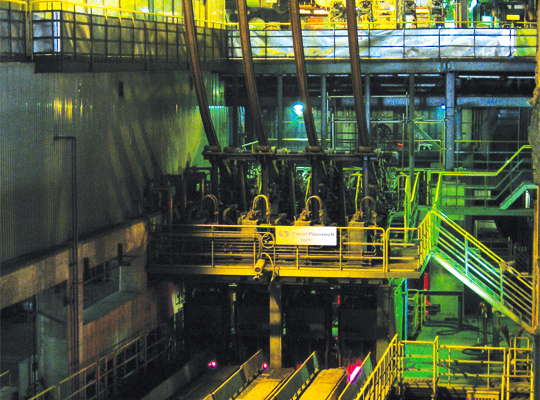 1Energy-saving through sequentialized processes enabled by direct coupling to rolling machines. 2Power-saving through automated and serialized operational procedures, and equipment monitoring system. 3Realization of productivity enhancement through improved capacity utilization and high-speed casting. 4Ensured maintainability through easy access to major equipment segments and use of maintenance equipment and failure diagnosis system. 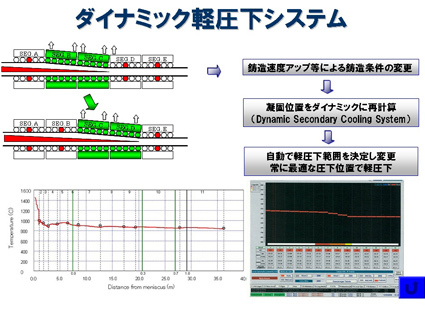 5Stable casting and reduction of unstable parts through mold-level control and optimum secondary cooling capabilities. 6Reduction of energy and costs required for rolling through near net shape casting (slabs close in shape to the final product). Steel Plantech has abundant experience in the development of multifunctional machines for a wide variety of slab sizes and steel grades. 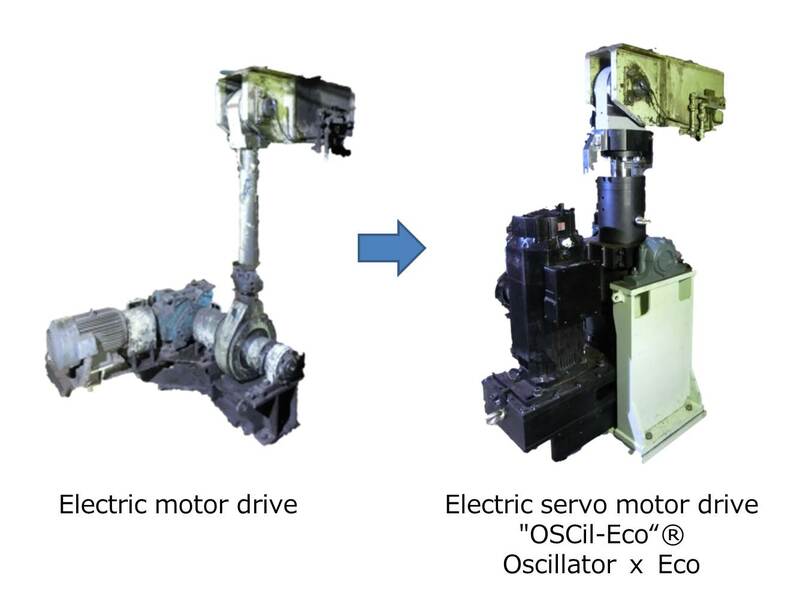 Although the rotating speed can be controlled on conventional mold oscillation systems driven by electric motor, only a single wave form (sinusoidal) of the same stroke could be achieved. The electric servo oscillation system makes it possible to control the wave form, stroke and oscillation frequency, so that molds can be freely vibrated. It is a technology that enables stable, high-speed casting by reducing friction within the mold by promoting the flow of powders and other lubricants through non-sinusoidal wave vibration. Soft reduction is one of methods to prevent the center segregation of continuous cast slabs during solidification by secondary cooling. Steel Plantech proposes its SP-Dynamic Soft Reduction System (SP-DSR), which can always achieve the optimum soft reduction. 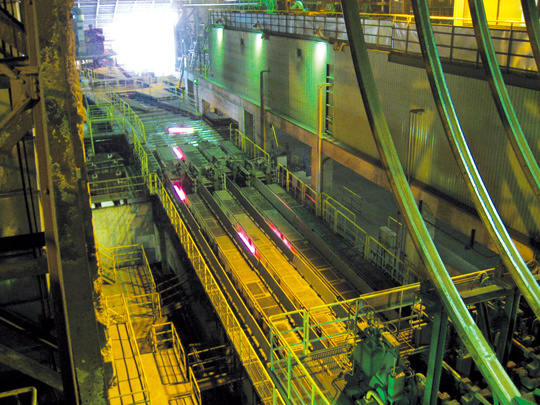 The final solidification position and internal temperature required for soft reduction are continually calculated online by the SP-Dynamic Secondary Cooling System during casting according to changes in operation conditions, such as molten steel temperature, components, casting speed and amount of cooling water. The SP-DSR system uses the information to calculate the segment roll intervals for the best reduction pattern and sends out movement directives based on the calculations.